Pin-up Bowl, as the name implies--isn't your typical neighborhood bowling alley. 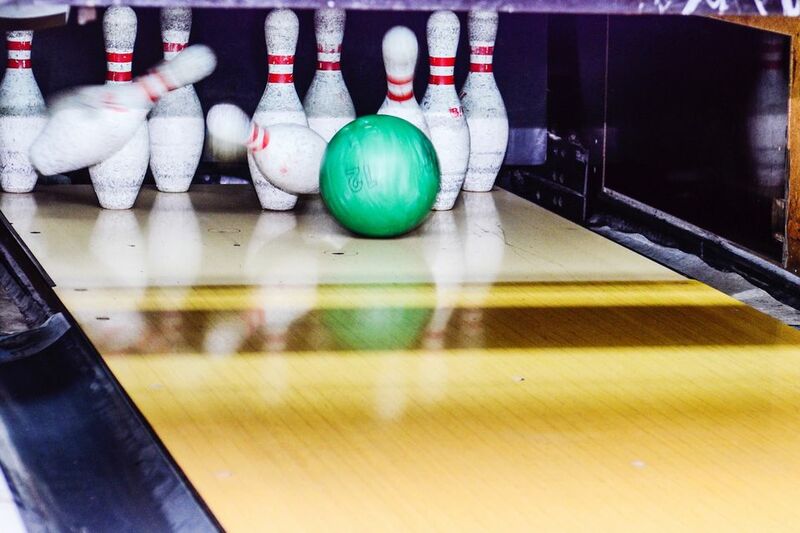 With retro-chic decor, swanky lanes and some super stiff drinks--Pin up Bowl is bowling at it's finest. I must admit, I'm not much of a bowler. A strike here, a gutterball there--I can't recall my score ever really breaking 100. But frankly, any bowling alley that serves top of the line martini's and smooth sounding cocktails sounds like a good time to me. Food: Serving up everything from Campell's Soup and nachos to toasted ravioli, pizza, sammies, and burgers. Also Worth Noting: No one under 21 allowed in after 9 pm. Our friends Melanie and Patrick are always up for a good time. So the pair, along with myself and my husband, Matt took the journey out to the Legends at Village West on a recent warm Saturday night. Walking from the parking lot to the back side of the Pin Up Bowl, we heard the loud smashing of pins being knocked down--and Melanie and I giggled with glee. We decided to grab a bite next door at Jazz, and then headed to Pin Up around 8:30. Walking in, you notice that Pin-up is a super-glam bowling alley. In the middle--a plush and retro furnished lounge area, to the right--a fully stocked bar. Towards the back--a gift shop and reservation booth. If it's your first trip to the Pin-up Bowl-I'll give you the scoop. You may reserve lanes ($30-50/h) or walk in ($3.50-4.50) and pay as you go. Since we hadn't made a reservation, we were told that our wait was going to be 30-40 minutes. There are only 12 lanes and the later it gets, the busier they are--the longer you wait. They suggested that we head to the bar, grab a drink and wait in the lounge. With time to kill, we headed to the bar and inspected their extensive list of martinis and cocktails. For the girls, raspberry lemon drop martini's ($7) Matt, Bud Light ($3.50) and Pat, a Red Bull and Grey Goose ($7). As we took our first sips--the three of us wowed with the potency of our drinks. After 35 minutes of sipping and lively banter--our lane was open. As Pat set up our names on the scoreboard--you couldn't help but take a look at our surroundings. Groups of girls giggling over wine, couples cheering on each other's gutterballs, a softball team noshing on bar food. With one martini down, it was my first at-bat. Amazingly enough, a strike--too bad the rest of my game didn't fare so well. I did have one victory (101-100)-Matt claims he threw the game, but my martini and I knew better.